It takes a lot of people to make the TC Crew program run smoothly, year to year. In addition to the time you spend taking care of your own son or daughter (and we know it's time-consuming) we depend on parents to pitch in to help plan and run our fund-raising events, prepare and serve food for our crews at out-of-town regattas, work at the regional regattas in which we participate, and help administer the program. Here are a few activities that need your help. Click on the link for more information. With any and all volunteer roles, you will be able to watch their son or daughter's event. Say "yes" to the call for volunteers, and if we don't call you, call us! Contact the volunteer coordinators - Dara Surratt and Phuong Yokitis - today! General Volunteer Opportunities - We have opportunities for everyone to volunteer. VASRA Regatta volunteers. We have to fill jobs at all the VASRA-sponsored regattas in which we participate. There are some jobs that get you as close to the action as you can be without actually rowing. Links to register for all VASRA jobs for each regatta are listed below. Register early! 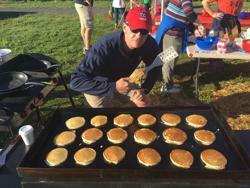 Regatta Food - Crew Boosters prepares and serves a hearty meal for the rowers at out-of-town regattas. We need people to buy and prepare the food, pitch the tent, serve and clean up. Spring Sweeps - Help organize and run our annual "fun-raiser" at the Old Dominion Boat Club. Hospitality. Help set up drinks and snacks at ACB functions, and organize the parents' potluck for regattas. Crew Closet. Our apparel mart needs salespeople for special events and occasional duty at the Boathouse. Car Wash. If you're good at supervising teenagers armed with water hoses, this is your chance. Crew Dance. Chaperone and serve refreshments as TC Crew rocks the Boathouse. TC Williams Athletic Boosters. We need one parent each from the boys' and girls' teams to represent Crew on the Athletic Boosters Board. Erg Sprints - An all-day indoor rowing competition takes lots of people to plan, set up, and run. Register online to volunteer. There is plenty of activity all year, and many ways to be helpful. Watch for calls for volunteers in the Hotline and on the website, and sign up.